Contrary to recent claims by Olympus regarding the safety of its duodenoscopes, the United States Food and Drug Administration (FDA) has put out a statement regarding the dangers of using duodenoscopes. Duodenoscopes have been in the spotlight over the past several years due to a large number of patient safety incidents reported around the world. “Today, we are issuing a safety communication reporting on these preliminary findings and providing important information for hospitals and health care providers who use and reprocess these devices. Interim results from the sampling studies indicate higher-than-expected contamination rates after reprocessing, with up to 3 percent of properly collected samples testing positive for more than 100 colony forming units of low concern organisms that are unlikely to cause serious infections (but an indication of a reprocessing failure) and an additional 3 percent of properly collected samples testing positive for “high concern” organisms. These are bacteria more often associated with disease, such as E. coli or Staphylococcus aureus (staph). The manufacturers are currently conducting root cause analyses to better understand these preliminary culturing results. Some factors that may contribute to device contamination include device damage and errors in reprocessing. Because of the higher-than-expected contamination rates and to help protect patients from bacterial infections associated with the use of duodenoscopes, we have included in today’s safety communication updated recommendations regarding steps that health care providers can take to enhance duodenoscope reprocessing. Hospital and health care facilities that use duodenoscopes should meticulously follow manufacturer reprocessing instructions. In addition, health care facilities should consider implementing supplemental reprocessing measures to reduce the risk of infection transmission, such as microbiological culturing, sterilization, use of a liquid chemical sterilant processing system and repeat high-level disinfection. The FDA previously issued a safety communication recommending these additional reprocessing steps to further reduce the risk of infection and increase the safety of these medical devices. In today’s safety communication, in addition to supplemental reprocessing measures, we are also recommending that hospital staff carefully inspect a component of the duodenoscope that is difficult to clean, called the elevator recess, and to repeat cleaning if any soil or debris is visible. We are also emphasizing that users follow the manufacturer’s recommendations for inspection, leak testing and maintenance of the duodenoscope and return the duodenoscope to the manufacturer, at least once a year, for inspection, servicing and maintenance. We also strongly encourage health care providers to participate in the manufacturers’ sampling and culturing studies, and consider initiating their own duodenoscope surveillance sampling and culturing to reduce the risks of infection. However, it has become clear that following the manufacturer’s reprocessing and maintenance instructions, while critical, is not sufficient to avoid all infections associated with the use of duodenoscopes. That is why the FDA has also been working with developers on new product designs, including disposable components. Technological advances in product design hold promise to reduce the risk of contamination and enhance patient safety. Finally, we rely on manufacturers to report infections associated with duodenoscopes, as well as other adverse events caused by medical devices, to the FDA in a timely manner – generally within 30 days of learning about the event. When this does not occur, patients’ safety and sometimes their lives may be put at risk. When this happens, the agency can and does take action. 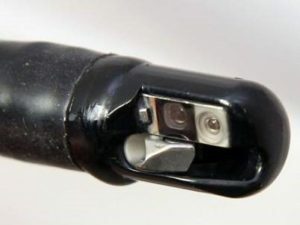 The FDA’s Office of Criminal Investigations recently worked with the U.S. Department of Justice to bring criminal action against Olympus for failing to adequately file adverse event reports involving infections that occurred in Europe in 2012 and 2013 that were associated with their TJF-Q180V duodenoscope. After pleading guilty to three counts of distributing misbranding devices in interstate commerce, the company was fined $80,000,000 and ordered to forfeit $5,000,000. As part of its plea agreement with the Justice Department, Olympus is also required to undertake enhanced compliance measures. I want to emphasize that an individual patient’s risk of acquiring infection from an inadequately reprocessed medical device remains relatively low given the large number of such devices in use. We have also seen a steady decline in medical device reports associated with patient infections after the FDA implemented safety measures to improve reprocessing techniques including issuing recommendations to health care providers to enhance their cleaning and high-level disinfection of these devices, working with duodenoscope manufacturers as they reviewed and modified their instructions for manual reprocessing and reviewing validated instructions for manufacturers of automated endoscope reprocessors that are used to reprocess duodenoscopes. A recent analysis of medical device reports indicates that the number of reports associated with patient infections peaked in 2015 at 250 reports and has declined 62 percent to fewer than 100 reports per year in 2017 and 2018. We are hopeful that this decline is the result of a successful effort on the part of health care facilities to implement our enhanced safety measures. As evidence continues to mount about the potential dangers of duodenoscopes, hospitals must ensure that they’re doing everything they can to protect themselves and their patients from harm. The FDA rightly points out that a major risk factor of using duodenoscopes stems from issues with reprocessing. Make sure that your staff is following the proper processes and protocols each and every time a duodenoscope is reprocessed. Systems such as iRIScope can display the proper workflow for reprocessing duodenoscopes and document the process in real-time. Any breaches of protocol can be alerted in real-time to protect patients and identify which staff members need additional training on reprocessing techniques. You owe it to your staff and your patients to offer everyone the peace of mind that duodenoscopes and all other flexible endoscopes are being properly reprocessed every single time.